By now you may have guessed that Mayleena is not from Earth, just like Etta. The lovely Mayleena, and all Oceanan people are humanoid in every way. Human beings from planet Earth could mate with them, as the history of their evolution in most ancient galactic history reveals they are intertwined. However, the Oceanan people evolved on their mostly watered covered world with the ability to breath on land or under water. Their skin is soft with a pale-blue hue that is similar to a blue moonstone faintly shimmering in the full-moonlight. Mayleena, Master Opellum’s daughter from planet Oceana, is in a romantic relationship with Kalem. Another intriguing point about the mysterious people of the hidden planet of Oceana is they are considerably evolved beyond human beings on Earth. They are spiritually, scientifically and technologically far more evolved, and far more ancient. Yet, nearly all of the inhabitants of Earth do not even know they exist. There are a number of covert subconsciously suppressed reasons why, but this will all soon change for the benefit of all life on planet Earth. 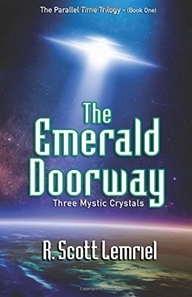 You can discover more about Mayleena, and her people, as well as Etta for yourself when you read The Emerald Doorway (Three Mystic Crystals) book one of The Parallel Time Trilogy.